Imagine hotels orbiting the Earth? Pretty hard to imagine, isn’t it? 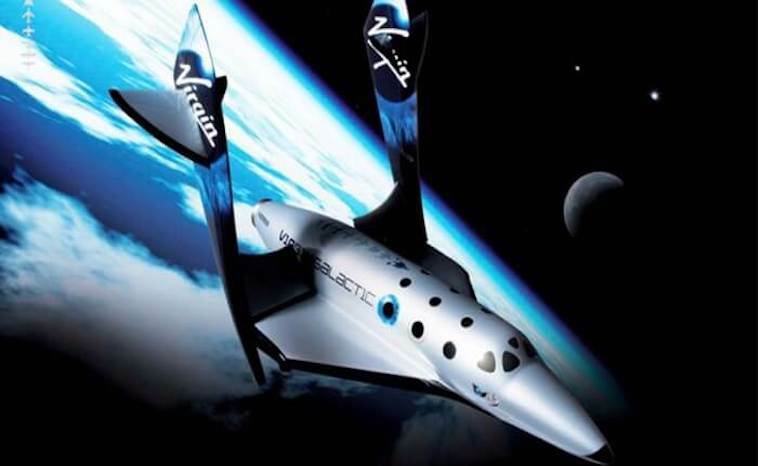 However, that vision inspires the goals of Richard Branson and his Virgin Galactic company. Similar to Jeff Bezos with his Blue Origin tourist program, Branson sees the same travel to space with groups of non-astronauts. In addition, he envisions hotels and science laboratories orbiting the Earth. What does a $200,000 ticket give you for a flight on Spaceship Two, AKA Unity? The flight time will last 2 1/2 hours from start to finish. According to their website, this flight will carry six passengers and two pilots into space. After a successful launch, the ship will enter the Karman line, and experience a period of weightlessness for five minutes. How does this ship compare to Blue Origin? Unity has a unique feature. It has variable-geometry rudders that can rotate 90 degrees. It allows the pilots to “feather” the rudders to increase drag and control the vehicle. The plane has a length of 60 feet (18.3 meters), and a wingspan of 27 feet (8.3 meters). Without a rocket booster, how will the vehicle get into space? Unlike the rocket system used in Blue Origin, the Unity will hitch a ride on an airplane called WhiteKnightTwo. The WhiteKnightTwo will carry Unity to 50,000 feet (15,240 meters). At this point, Unity will detach and fire its rocket. The rocket fires for 70 seconds to boost the vehicle to maximum altitude. As it climbs, it will spend 90 seconds traveling at the speed of sound (2,500 mph). As of July 27, 2018, Unity reached a maximum altitude of 170,800 feet (52,050 m). The goal is to reach 328,000 feet (100 kilometers) altitude so that the passengers can earn their astronaut wings. At this point, the booster rocket shuts down, and Unity will coast higher. After reaching the highest altitude of 361,000 feet (110Km), passengers will experience weightlessness. The wings then pivot 90 degrees into their feathered positions. This will help on re-entry back into Earth’s atmosphere. The wings in that position will assist with drag and reduce heating from friction. As a matter of fact, Virgin Galactic states that heat shields are not needed. In 2014, a tragedy occurred when the SpaceShipTwo’s “feathering” re-entry system deployed too early. They have since fixed this problem by removing the pilot’s ability to deploy the re-entry system. Once it drops down between 70,000 and 60,000 feet (21,336 and 18,288 meters), the wings return to their original position. Next, Unity will glide for 30 minutes before touching back down on Earth. Landing gear then deploys for landing on a conventional runway. Right now Richard Branson waits for Unity to safely fly to 264,000 feet. Once the aircraft reaches that and returns safely, Branson plans to take a trip into space himself. It will be interesting to see who joins him on this initial flight. Will space hotels be next for the Virgin brand? We shall see.